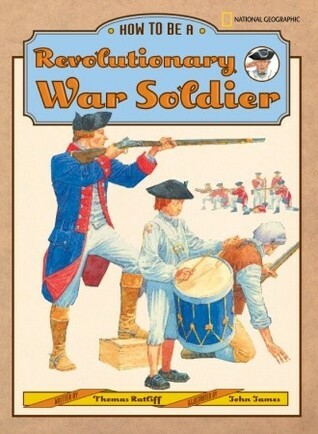 Have YOU got what it takes to be a Revolutionary War soldier? This creative history book places kids smack in the middle of the war for independence through the pretext of applying for the job in the army. Opening with a job description that includes such duties as marching, drilling and following orders, the book includes a brief overview of how the war started before delving into the typical life of a private. Covering hierarchy, pay, training, uniforms, weapons, and more, details about major battles and important generals are woven in. The volume concludes with an interview in the form of a ten-question, multiple choice, reading comprehension quiz. Many of James’ finely drawn and colorful center panels contain comic book style dialogue bubbles that enhance the text and add a touch of humor.The layout is traditional: a few paragraphs to the left of each two page spread with a large illustration in the center, surrounded by a clockwise series of subheadings with more text and graphics. This design is a little busy and doesn’t take into account the quirky way the millennial generation scans a page (bottom and sides first, honing in on the center). Sidebars include how to load a musket, excellent labeled clothing diagrams, and photos of artifacts such as surgical instruments, a cannon and specie.One strength of the “How to Be A” series is that the authors have a deep and specific interest and expertise in their topic. Ratliff, a history and poli-sci educator for teens, is no exception. His narrative is clear, interesting facts are well-selected to maintain interest, and the second person perspective is captivating.The glossary is brief and composed mostly of words defined in context. Sources are cited only for photos, and just two books are recommended for further reading (one published by the same company as this one). This is an engaging and thorough introduction to 18th century military life during wartime.